I think so, yes. The two things were closely connected in the circle around Althusser at the École Normale Supérieure, but before that there had already been some indications. I was born in 1942, so was still very young in the late 1950s and early 1960s. This was a period in which young intellectuals – educated people belonging not to the middle class in the English sense, but to the class moyen in the French sense; that is, people whose families were ofﬁcials and teachers – formed their political consciousness and commitments in the circumstances of the colonial wars. My parents were secondary-school teachers and on the Left. My father was a mathematician. He was taking part in protests against torture by the French Army in Algeria, because a French mathematician who was a communist had been killed there, for helping the Algerians. I came to Paris in 1958, after the lycée, to join the special classes where you study for the exams for the École Normale. So I left the family. In Paris, I immediately joined the demonstrations against the war and acquired some sort of anti-imperialist consciousness. By the time the war was over in 1962, I was a student at the École Normale, which was extremely politically active then. All of us were members of the Studentsʼ Union and were engaged constantly in demonstrations and discussion. Most of us belonged to political groups or parties. The Left was divided between the communist wing – very strong at that time – to which I belonged, and the left socialists, the PSU, which was a small breakaway party from the Socialist Party, opposed to the colonial war, which the Socialist Party had been waging before it lost the election. Badiou and Terray, for example, who were a little older than me, belonged to that group. We had ﬁerce quarrels, but were united on the main roads. If I had been a little older, perhaps I would have had more difﬁculties in joining the Communist Partyʼs youth organization, because of the events in Hungary in 1956. But at the time, a number of us thought that the Communist Party – with all its errors and mistakes and questionable aspects – was the strongest and most powerful organization on the Left, particularly in opposing the colonial war. So we joined it. I became a member of the Union des Étudiants Communistes in 1960 and of the Party itself in 1961. From the beginning that meant taking part in internal debates and controversies. I hoped that the Party, and more generally the system of organizations around the Party, would allow a young intellectual not to remain imprisoned in a purely intellectual environment. This factor was very inﬂuential some years later in pushing many friends and comrades in our group towards Maoism, because the idea was always to join the working class, not just symbolically, but also physically, so to speak. Of course we were to be very disappointed, because in a place like Paris the Party carefully reproduced the bourgeois division of labour, and isolated intellectuals from the working class, particularly those intellectuals who were critical in one way or another. So that was the beginning of my political commitment. As for philosophy, it came a little later. At the École Normale the exam was a multidisciplinary one, which meant that it provided a fairly complete education in the humanities. I still beneﬁt from that. So I studied literature and ancient languages, German, and some philosophy, but no more than other subjects. History was very important and I had an interest in mathematics too. Initially, I hesitated between ancient history and archaeology, which were extremely prestigious and attractive to young humanists like me. I started to follow courses in literature and ancient history, but found them terribly boring. At the same time I realized that the philosophical conjuncture was extremely exciting. Sartre had just published the Critique of Dialectical Reason. Merleau-Ponty was delivering his lectures at the Collège de France (he died a year later). Lévi-Strauss, whom we always considered a philosopher, was publishing his most brilliant essays. And I was strongly attracted by that. I thought, why not? Why not me? I should add that the director of the École Normale at that time, who also taught, was Jean Hyppolite, the French translator of Hegel. The three people who were most inﬂuential on my philosophical education in those early years were Hyppolite, Althusser and Sartre – whom I ﬁrst heard speak soon after I decided to change disciplines. A little later, there was Georges Canguilhem at the Sorbonne; my friend Pierre Macherey, who was a little older than me, took me to his seminars. But Hyppolite was the ﬁrst, though I didnʼt understand much of Hegel at that time. I found it extremely difﬁcult, but it was a challenge. In my ﬁrst year I decided that I would read simultaneously the Critique of Pure Reason and the Critique of Dialectical Reason: Kant and Sartre. I didnʼt succeed, because we were spending all our time on political initiatives, but it provoked a great intellectual enthusiasm. I was certain I had made a choice, but for a long time I felt a doubt. I was never sure that I was a proper philosopher. Now I know that nobody is a philosopher in that sense. Althusser would always say that you are not sure of your identity, but you do as if. Youʼre not sure that youʼre a philosopher, but you do as if, because your students need you to represent that ﬁgure. It was a combination of things. The very word ʻscienceʼ had a symbolic weight, a sort of mystical aura, which allowed us to dream of combining all these aspects together. The idea of a scientiﬁc foundation for politics – working-class politics – was inherited from the Marxist tradition, but the humanistic aspect of our training was also very effective. Almost all the young philosophers around Althusser – Rancière and Duroux (who was extremely important in our group, although he never published anything), Macherey, Badiou, myself and others – were humanists, dreaming of a more rigorous language and way of thinking. Some of us also had a speciﬁc interest in such disciplines as logic and mathematics; I myself started to study mathematics and logic in those years. But in the end we realized that we couldnʼt do everything at the same time. One reason I admire Alain Badiou is that he is probably the only one in our group who has a complete and up-to-date training in important branches of mathematics – the foundational part. But this certainly has a counterpart: he is no more universal than anyone can be. This explains why communication is so difﬁcult with philosophers from the ʻAngloSaxonʼ tradition who have adopted the so-called analytical method. Itʼs not a conﬂict between people who have a scientiﬁc ideal in philosophy and people who are only humanists and have a literary ideal. Itʼs a conﬂict between two different models of science, two different scientiﬁc ideals. This is why they compete so strongly and provoke such misunderstandings. To put it bluntly, Iʼd say that to most analytical philosophers, including analytic Marxists – such as my friend Gerry Cohen – the kind of so-called scientiﬁc model we have in mind is pure literature. And to us, the kind of ʻscientiﬁcʼ model they have in mind is not so different from that of a medieval scholastic. We have the model of an axiomatic theory. They have the model of proof: proving by arguing. This is very revealing of the antagonistic ways in which the notion of science can be applied outside its proper location. Although we did not exactly follow Canguilhemʼs example in acquiring a complete training in a scientiﬁc discipline (he was a doctor of medicine), we did follow him in the belief that you cannot do serious philosophy of science if you see it from outside, if you have not trained in the discipline itself. In the end, that provoked a paradoxical effect. In my own case, in the 1960s and 1970s, when I tried to work on epistemological matters such as determinism and explored the possibility of adapting a scientiﬁc method to historical and political matters, I was still hoping that I would improve my scientiﬁc training in the precise sense of the term. But at some moment – and this probably coincided with the implicit abandonment of the epistemological paradigm in Marxism and in politics more generally – I realized that it was impossible, practically. When I say that I abandoned the scientiﬁc paradigm, this means that I renounced the idea that politics or philosophy are scientiﬁc in their method and their results. But this doesnʼt mean that I ever joined the camp of those who view science or scientiﬁc reason as an alienating form of intelligence. It doesnʼt mean I despise scientiﬁc thought. I remain completely opposed to a certain post-Marxian or post-Hegelian tradition, represented by Lukács and the Frankfurt School, which has contributed to the constitution of the so-called postmodernist attitude, which would present the idea of scientiﬁc objectivity as a misleading or remiss direction for humanity. There were two steps. One was common to Althusser and his small group of students, just before and just after 1968. The other had nothing to do with Althusser and came much later, in the 1980s. The ﬁrst was the so-called self-criticism, organized around the idea that Marxist philosophy – or philosophy from a Marxist point of view – should not be developed after a scientiﬁc model, as a sort of ʻscience of the sciencesʼ or scientiﬁc critique of all sciences, but rather after the model of political conﬂict, as the so-called class struggle in theory. Althusser had always maintained the idea that there is something intrinsically equivocal or ambiguous in philosophy, inasmuch as it combines a scientiﬁc ideal with a political ideal. In many respects this is a Platonic view of philosophy. Iʼm amazed now to see that Althusser was a Platonist in that sense. But at a particular moment the primacy was reversed. Instead of maintaining that philosophy is a political discourse which tries to become scientiﬁc, it became the other way around: the idea that philosophy is a theoretical – and in that sense scientiﬁc – discourse which ultimately is shaped and determined by its political function. That was the ﬁrst wave. For me, the second wave began when I started writing on Spinoza and when I also started thinking about new political issues which have to do with identities – ambiguous universality, as I call it. This forced me to abandon not only the pure or ideal scientiﬁc model of philosophy, but also the narrow or one-sided insistence upon class struggle in theory. Itʼs not that I donʼt believe in class struggle – that theory is inseparable from class struggle – but I am convinced now that the relationships between theory and practice are more complex, and perhaps distorted. As a consequence, I donʼt like to use terms such as ʻhermeneuticsʼ or even simply ʻcritical discourseʼ. There is an aporetic element in philosophy. Philosophy is made of conjectures – conjectures and conjunctures, from a theoretical point of view – and thatʼs a long way from the model of a scientiﬁc axiomatic. The group of people around Althusser in the late 1960s and early 1970s tried to reconstruct Marxism in a new way, by abandoning linear causality (which in the Marxist tradition is hardly to be distinguished from linear teleology) and introducing ideas such as overdetermination, the autonomy of the ideological structures, and so on. But at the same time this Marxism remained extremely orthodox, and very far from the libertarian tendencies you have mentioned, in the sense that it continued to view the class struggle as the last instance. For example, take the way we understood ʼ68. In France, at least, ʼ68 provided the idea that there are speciﬁc political issues at stake within culture. It provided that idea with some sort of obviousness. But you could move in several different directions from there. One could adopt what you have called a libertarian point of view, or one could try and understand it as a development of the Marxian notion of the superstructure. Initially, thatʼs what we did. That was what Althusser tried to do in his essay ʻIdeology and Ideological State Apparatusesʼ and this is what I have tried to do by enlarging the concept of the class struggle. Not only did it remain the general model, but it was supposed to be the centre around which every political and theoretical pluralism gravitated. This is not so stupid as one might think today. It proves extremely difﬁcult to relativize the model of the class struggle as a key to the understanding of social problems without renouncing notions such as exploitation, and hence without accepting the idea that social conﬂicts are secondary with respect to social harmony or consensus. I agree with that less than ever. Second, if you look at other social issues, such as feminism, I have the impression that the theorization of the importance of gender conﬂicts and of patriarchy to the history of society are very much indebted to the model of class struggle. You might say that this antagonism is as universal and as decisive as the class struggle itself, although it is different, and therefore in conﬂict with it, practically and theoretically. Compare this to Foucault. He progressively developed an alternative model which was clearly aimed at relativizing the model of the class struggle. This was a model of agonism: not antagonism, but agonism – an unstable relationship of competing forces and practices, centred on historical agencies rather than social groups. But there is a limit to that, which is very clear, both in the case of class struggles and in the case of gender oppression. The model is opposed to any deterministic view of a relationship of forces as established once and for all, and it suggests that there is always resistance – thatʼs the main idea – and this resistance is itself part of the process through which equilibrium is produced. Itʼs Machiavellian, rather than Hegelian or Marxist. But the old vested dominations are extremely difﬁcult to describe that way. There are structures of rational exploitation which are not reducible to the agonistic model. Not only in France. 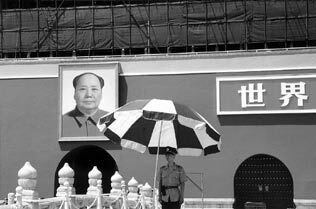 Maoism was inﬂuential in all those European countries where there existed a strong institutional Communist Party. Maoism was strong in France in the 1960s and 1970s just as it was in Belgium, or in Italy, or in Spain, to some extent, although the Spanish case is more complicated because of the ﬁnal years of the dictatorship. Wherever the Communist Party itself was strong, Maoism was attractive. It appealed to intellectuals, students, and possibly some workers too – although the main Maoist organizations in France were the student organizations – because it presented itself as a radical version of the original purity of the communist model. It was the last attempt at re-creating an ideal communist party. As such it offered an escape from the kind of indignity which is intrinsic to communist parties within the national social state, where the working-class organization has a revolutionary discourse but performs an integrating function for the working class within the structure of the welfare state. Itʼs part of the social equilibrium of forces within the welfare state. That was the typical contradiction of the Communist Party in France. French Maoism was a movement of young intellectuals who revolted against the normative forms of traditional bourgeois culture. This is a story of one generation, a generation whose parents were in the Resistance or had taken part in major class struggles after 1945, or had belonged to the Communist Party and abandoned it, or been thrown out, and so on. They were fascinated by the Maoist model because it seemed that at an international level China represented the solution to the eternal crisis of the communist movement. I was myself strongly attracted by an ideal Chinese model, the Cultural Revolution, which we projected upon China, whose real history we totally ignored. Remember, we had very partial and generally wrong information about what was actually taking place in China. We imagined the so-called Cultural Revolution as a combination of two aspects which in our own countries could never really unite: a libertarian revolt against bourgeois norms and an effective movement against capitalism. This could be summarized in an ideal picture of the Cultural Revolution and the Red Guards. It was the dream uniﬁcation of post-Nietzschean cultural revolt and the Marxian class struggle. And it led to very dubious and oppressive forms of organization. In the French case, owing to people like Robert Linhart (who personally paid a very high price), it didnʼt lead to terrorism, but it was an extreme practice, worse than the Communist Party in terms of suppression of any opposition. It was a terrible contradiction. Youʼre probably right, yes. This was one of the most horrible mistakes of that period. Most radical young communists in the 1960s and early 1970s in France were (rightly) convinced that the Soviet Union was acting at the international level as a conservative force. My friend Immanuel Wallerstein has recently gone so far as to argue that the Soviet Union was the most effective instrument in keeping the international system of states stable, which is itself the decisive part of the capitalist world economy. This allows him to describe the ʼ68 movements of students and young workers, around the world, as a revolt against the state system of the world economy, including of course the socialist states and the communist parties. But even if you donʼt see things so … I wonʼt say mechanically, but in such a coherent or systemic way, the socialist system in that period was in practice acting as a stabilizing, conservative factor. And for that reason the communist parties in the West that were most directly dependent – politically and ﬁnancially – on the politics of the Soviet Union acted in the same way. They were more or less forced to include ideological concessions while periodically making declarations that they were backing the revolutionary movements in the world. The ideal picture of China as the great support for all revolutionary groups in the world began to collapse in the early 1970s, when we had discussions with the Vietnamese comrades themselves. There were thousands of them in France, as students and so on, and they would explain to us that things were not as simple as that. Next, the Chilean events were extremely important: China supported the Pinochet coup. This played a crucial role in driving individuals in two completely opposed directions. I could give you examples of people in my generation who moved from a traditional communist commitment to a pro-Chinese enthusiasm, and from there to almost anything: cynicism, religion, Cold War liberalism, and so on. It had a terribly destructive effect. It didnʼt last long, but it had a terribly destructive effect. But communism is an idea which existed before Marx and Marxism, and itʼs likely to exist after the end of Marxism as a movement and a coherent theory. So there might be something like a post-Marxian communism. Even a post-Marxian communism must inherit something from a Marxian communism. One of the key elements which is already being inherited is internationalism. In a sense, internationalism is the most paradoxical issue in the story of Marxian socialism – actually existing socialism – because it was always invoked as an ideal, but almost completely contradicted in practice. In todayʼs world, ex-Marxists are not the only ones who represent those people with the ability and desire to cross boundaries – state boundaries, cultural boundaries – and work in the direction of some sort of transnational community of progressive forces. The legacy of French Maoism is a very deep commitment to internationalism. As you say, the book was published as La philosophie de Marx, but if I could I would have opted for something like the ʻphilosophiesʼ of Marx, because the idea was to explain in an aporetic manner that under the cover of a single doctrine or a uniﬁed philosophy, as it was created by the Marxist tradition and possibly also dreamt of by Marx himself, there doesnʼt exist anything actually uniﬁed which can be completed. One has to decide whether this has to do with a speciﬁc case, Marxʼs fate, or whether it is something more general. Having been deeply involved in one of the attempts to reconstruct the unity of Marxism, I now clearly see not only that it was aporetic, but why it didnʼt lead to the result which had been imagined. It was not accidental. It was not simply because Althusser was ill, or because the conjuncture in which he tried to combine a political commitment with theoretical activity, instead of being extremely favourable, as he imagined, proved to be very difﬁcult. There were intrinsic reasons. I tend to the idea, not that there is no theory in Marx, not that there is no philosophy in Marx, but that this philosophy is and remains the virtual combination of different and to a large extent contradictory orientations and concepts. I call it Marxʼs boundary position with respect to philosophy, which is not something negative. This is something which remains to be more fully elaborated, because it could be interpreted in either sense. Even if literally speaking it only applies to the speciﬁc case of Marx, I do not object to trying to apply it more broadly. In that case we would be led to the view that philosophers proper – greater or smaller – do not build systems of doctrine. There is an intrinsically aporetic element in every proper philosophy. And this is why so many decisive books in the history of philosophy are unﬁnished, and cannot be ﬁnished. Itʼs not that philosophers are not systematic, that they donʼt want to build systems; philosophy would not exist if a philosopher was not dreaming of achieving a system. The greatness of important philosophers lies in the way they fail to do it. A number of people laugh when I say that, and say that I am obsessed, that my own experiences with Marx have distorted my mind. One of my friends, Alexandre Matheron, who is one of the best French specialists on Spinoza, said: ʻYou want to ﬁnd new aporias every year: the concept of the masses in Spinoza is aporetic, the concept of democracy is aporetic, and so on. This is crazy.ʼ I replied that there must exist a counterpart to the position which aims at producing and manifesting the latent unity and coherence of any philosophical doctrine. Why donʼt we stick to the good old terminology: it has to do with the relationship between ideology and philosophy. It has to do with the fact that the great philosopher never simply and consistently belongs to his own ideological camp. This is not an abstract principle, there is evidence to support it. And it doesnʼt have to do primarily with the subjective or purely psychological element. The extent to which great philosophers desperately try to provide their own camp with a discourse that is exactly the opposite of what the mainstream wants is amazing. Itʼs not only Plato arguing for a monarchy or a tyranny which leads him to prison. Itʼs not only Aristotle trying to replace the existing concept of democracy in Athens with a new foundation which goes beyond the opposition between aristocracy and democracy. Itʼs not only Hobbes trying to convince the British monarchy that the best foundation is to be found not in the divine right of kings, but in some kind of radically democratic foundation. Itʼs something more profound. Itʼs the posthumous effect of any great philosophy. Just as there is a left-wing Hegelianism and a right-wing Hegelianism, so there is a left-wing Marxism and a right-wing Marxism. At the very heart of every great philosophy lies a contradiction between the ideological commitment and the objective logic of the arguments. Willingly or not, a philosopher reopens the issues that ideology closes. This is why the political position of philosophers is sometimes extremely dubious – Plato and Heidegger, for example. Youʼll never succeed in reducing the signiﬁcance of the arguments to the ideological goals they are supposed to serve. I agree, but Iʼm not in a position to prove anything Iʼm saying here. These are conjectures, guesses, subjective justiﬁcations given a posteriori for a certain way of writing about philosophy or making use of philosophical notions in my work. In Luhmanian terms, ideologies are complexity-reducing machines, and the dichotomous character of most ideological alternatives is extremely powerful in that respect. It dominates the social and human sciences. Itʼs one of the strongest indications we have that, for all their technical and scientiﬁc methodology, and their contributions to experimental knowledge, the social sciences remain basically ideologies. You are constantly urged to choose between individualism and holism, for example, or behaviourism and the hermeneutics of consciousness, and so on. Yet a conjuncture in which practice and theory are intermingled and acting one upon the other is never reducible to ideological alternatives in this sense. The interest of philosophy lies precisely in that direction. Usually philosophers choose one side. They are basically individualists, for example, rather than holists, or they are nominalists rather than realists, and so on. But when they start trying to elaborate this position in a consistent manner, they usually succeed in destroying their initial position. There are so many examples of this. Every philosopher has a ﬁrst philosophy and a second philosophy which destroys it. Philosophers push the real contradictions in the conjuncture to the extreme. They give an extreme formulation to latent or intrinsic contradictions in the conjuncture, which no other discourse does in the same way, because the others are all governed by the need to reduce complexity. The counterpart to this is that, as a literary genre, philosophy is an open domain. There is no question of deciding in advance that this kind of writing or theoretical activity is philosophical and that not. thequestion of a speciﬁcally philosophical universality. One can imagine two rather different positions on this: one would say that philosophy aspires to the domain of real universality – that philosophers are seeking real universals; the other, perhaps more consonant with your own practice, would say rather that philosophy reﬂects upon a multiplicity of competing universals. But that leads straight back to the problem of univocity, because if you have a discourse on the multiplicity of universals, thereʼs a sense in which you have a univocal discourse on multiplicity. Thatʼs a strong objection, and it might force me to adopt a position which many people would object to, because itʼs sceptical in the sense I mentioned earlier: itʼs aporetic. So it wonʼt convince anybody who has a purely rationalist view of philosophy in which philosophy expresses the univocal element of universality that overcomes this multiplicity or ambiguity. Some of us who had more or less the same starting point, the same inﬂuences, now ﬁnd ourselves at opposite ends of the theoretical spectrum on this point. This is the point, for example, on which Badiou and I completely disagree, although we would both accept something like the idea, which is implicit in Lacan and explicit in the early Wittgenstein, that there is no metalinguistic level. I try to be absolutely consistent about that. For me, philosophy is a discourse, or, better, a certain praxis of discourse, which explores the equivocity of the idea of universality. Philosophy itself is caught up in the ambiguity of the universal. Of course, you ﬁnd philosophies in which one aspect or the other becomes dominant. And there are philosophies which are mainly cosmologies. There are many who are busy with the question of the real, the unity and the multiplicity of the real, the effective and the virtual aspects of processes and connections, and so on. Badiou was right, I think – although many Deleuzians objected – in digging out that element in Deleuze. Itʼs the multiplicity of the real as such which becomes the centre of his philosophy. Well, it claims to be a philosophy in a more classical sense of the term than was admitted by the critical tradition, not to speak of deconstructive or postmodern conceptions of philosophical practice. But this is where things become interesting, because this is only the envelope, the external coat, as it were. What does Deleuze try to rethink? He tries to rethink the relationship between individuality and pre-individual forms of life or process. I admire A Thousand Plateaux very much in this regard, although Iʼm not sure that I understand everything. It is perhaps an imaginary philosophy. But, on the other hand, there is an imaginary element in every philosophy. Itʼs not that Deleuze has introduced a radically metaphorical element. He hasnʼt. Itʼs rather that he has completely abandoned the game of metaphors which was established in the rationalist humanistic tradition that comes from Aristotle and leads to Kant and Hegel: the idea that the human individual as such belongs to a different realm – either because of consciousness or because of being a political animal, or whatever. This is what Deleuze radically destroys. It depends on your understanding of the relationship between metaphysics and social practice. Deleuze is extremely important because he shows how superﬁcial and fragile the rules are which allow the individual to keep a good distance in social life, and prevent other peopleʼs thoughts and needs and desires from intruding into his or her identity – and the reverse too, of course. These are trans-individual processes, which are, as Freud would say, primary processes. Released from the Oedipal securities, they come to the fore. They are closely connected to what I call ʻthe massesʼ. But the situations in which you can allow yourself to forget about the safeties and securities of conscious individuality and responsibility are extremely rare and extremely perilous. So, to reply to your question: Iʼm not sure that I want to be a consistent Deleuzian in social and political practice, or even in intellectual life. But I am sure that it is a very important thing to question, radically, the apparent autonomy of the individual as it is embodied in juridical, psychological and political traditions. Mine is the second position, provided you donʼt understand it as a simple reversal of the traditional pattern. Itʼs not only a matter of challenging the picture of the imaginary as a false representation of the real; itʼs also a question of rejecting the idea of the imaginary as the by-product of the real. If there is a common strength in contemporary French philosophy, with all its oppositions and conﬂicts between positions, it is the attempt to overcome this dualism of the real and the imaginary; just as it is intent on overcoming another basic dualism, the dualism of facts and norms. This accounts for the simultaneous proximity and distance of contemporary French philosophy towards the dialectical tradition. Hegelian and Marxian dialectics were already to a large extent exactly that: an attempt at overcoming this kind of metaphysical dualism. Just as Hegel spent all his life struggling against the opposition of fact and norm (which many rationalists today still consider the absolute basis for any serious way of thinking), so Marx, in this amazing chapter on fetishism, was challenging the dualism of real and imaginary. Thatʼs why itʼs still so intriguing. Of course, the dialectical way of overcoming is permeated with the idea of a third, synthetic concept into which the opposite aspects dissolve, and this is not what contemporary French philosophy has in mind. In that sense, weʼre back to the aporetic element: itʼs the passing of the imaginary into the real, and the real into the imaginary, in the form of irreversible events, which becomes crucial. Much of the French tradition – and I personally would incline in this direction, with some qualiﬁcations – has combined the lesson of Spinoza with the lesson of Nietzsche, in order to introduce into Spinoza himself something like a tragic element, which is very far from many classical readings of Spinoza. So itʼs a symptomatic reading of Spinoza, and there are nuances among us, in that respect. An anthology was recently published in the United States called The New Spinoza which shows the divergences as well as the convergences between the different people working in this area. Take the category of the multitude. I wrote my essay on the masses in Spinoza by developing an interpretation of the concept of the multitude in Spinoza which has some basic elements in common with the Deleuzian–Negri interpretation, but in the end it produced almost exactly opposite results. Deleuze has transported a vitalist conception of the multitude into the political ﬁeld, and an imaginary that connects individualities within the multitude, which produces completely optimistic effects. This is a very naturalistic view of the imaginary, in which the forces of life and love inevitably overcome elements of conﬂict, hostility and destruction. It is utterly opposed to a certain part of the Freudian legacy – Civilization and its Discontents – and any interpretation of the basic imaginary processes in which ambivalence is constitutive. On the other hand, I have the impression that the doctrine of the imaginary in Spinoza leads to the opposite conclusion: namely, that every rational political construction is a way of developing the power of the multitude that remains caught forever in ambivalence. There is an element of ﬁnitude. From the Spinozistic point of view, politics is a rational construction within the imaginary which has to do with the contradictory directions into which collective desire can evolve. There is no question of eliminating that element, but only of controlling the effect, and if possible controlling it from inside. The most difﬁcult problem is ʻcivilizingʼ the politics of the masses from the inside. Marxism completely failed, not only to understand but also to implement the civilization of the revolutionary movement of the masses from the inside. The only solution it found was an authoritarian one, which was used to destroy every genuinely revolutionary impulse. There is a normative element, but itʼs immanent, I hope. Normative, but not repressive. The term I use, which takes me closer to some formulations in Deleuze (but not to those used by Negri) is ʻﬁctionʼ. There is an element of ﬁction which is the opposite of what we spoke about at the beginning: it takes politics into the vicinity of art, not science. There is an invention of forms of life which regulate the ambivalence of the imaginary. The aporia that progressive movements have faced throughout history is that conservative structures – be they of the state or religion – are the most powerful devices for regulating this ambivalence in a normative and authoritarian manner. Every challenge to the established order brings a collective movement into the perilous zone we were speaking about previously, where you forget about the safeties and securities of conscious individuality and responsibility. This is a zone into which, for example, Europe was thrown during what Hobsbawm calls the ʻsecond Thirty Yearsʼ Warʼ, after the Russian Revolution and the development of fascism. Let me lay down some elementary points of reference. A reasonable candidate for what I call a real universal would be the market, the global market. The question of the importance of classes as collective political subjects leads to the following alternative: are classes mainly unities which derive from the market structure or from the state structure? Itʼs not very easy to reply, because there is an interaction between the two aspects. Classes are formed at the interface where these two structures combine and compete. In the nineteenth century, the description of social reality in terms of class struggles drew its strength and its power of conviction from the fact that the state was a formal organization which could not claim to encapsulate the basic determinants of class struggles, which were to be explained much more in terms of the expansion of the market, including people – not only the circulation of commodities but the circulation of men and women as labour power, as well. But in the period now coming to a close, if classes are to be considered as real forces acting in the political ﬁeld, they have been so primarily as forces within the state structure, or as some sort of counterpart to the central state itself, negotiating with the state. In the end, classes have been functional to the national state structure. What grounded the politi-cal subjectivity of classes was not only the idea of common interests, or a more or less coherent representation of society; it was also the building of continuity into the time of history – a combination of the representation of history as a continuous process with the anticipation of a singular or catastrophic event, in which the political subject would reverse the course of history. In todayʼs situation, political subjectivities are at the same time both necessarily bigger than the national space and smaller or less comprehensive and universal than classes used to be. They ﬁnd themselves in a time–space which is no longer capable of being represented in terms of continuity in the old sense. Perhaps they are more fragile as institutions, but harder to suppress, since they are permanently reconstructing themselves. I am extremely sceptical about the possibility of building something like a unity of individuals and groups at world level, in a permanent way, which would push in the direction of a more cosmopolitan and democratic status for the border as an institution. On the other hand, I am convinced that the problem is unavoidable. To take just one example which deserves a fuller discussion in its own right, the different status of so-called communitarian and extra-communitarian populations is going to become more and more urgent as the construction of Europe proceeds. And it will lead to very intense and perilous situations. I see no reason why the social protest should be progressive and healthy on that side. At the same time, I think we can look forward to a movement of democratization aiming to suppress what I call the non-democratic aspect of democracies, characterized by the institution of the border as an authoritarian way of controlling individual and collective movement. Vladimir Alpatov, Dmitri Lunov, Luri Medvedev, and Nikolai Nikolaev.